For January flowers, plant the bulbs in early October. 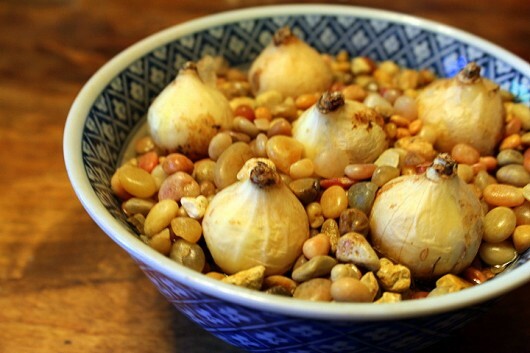 You can pot the bulbs in soil, or arrange them in a bowl of pebbles and water. 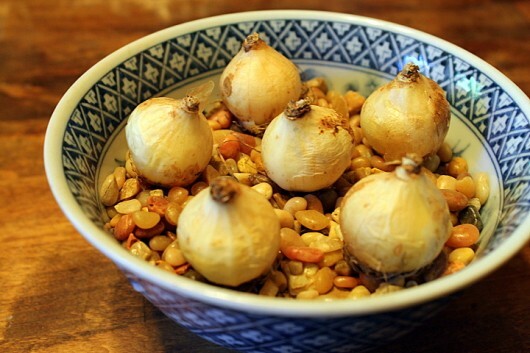 If you use an attractive bowl, you’ll find the bulbs can serve temporary decorative-duty on the dining table. First, select a bowl! 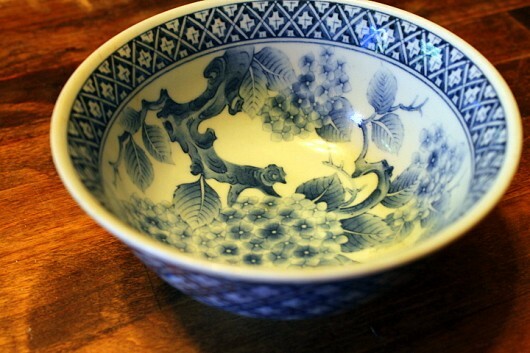 The blue and white Japanese soup bowl, pictured above, is approximately 6 inches wide and 3 inches deep. 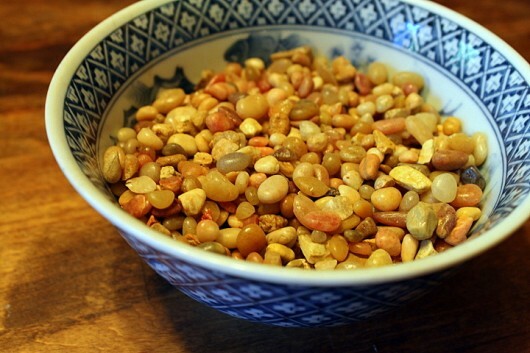 Then add enough pebbles to reach half-way up the sides of the bowl. Polished aquarium pebbles (available at most pet stores) are definitely attractive. They are reusable, too. 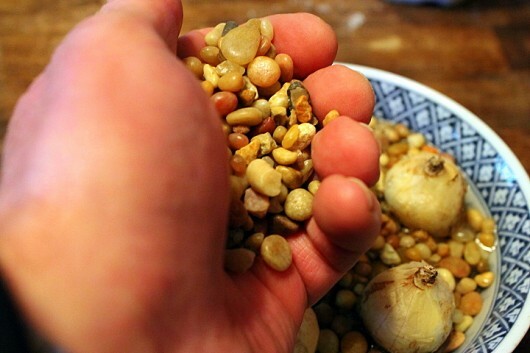 And sprinkle more pebbles between the bulbs, to secure them in place. Now comes the challenging part: finding a dark, cold (35°F-45°F) place for the 10-week rooting-period the bulbs require. An unheated garage, a cold cellar, or a refrigerator will work. If you place the bulbs in your refrigerator, you will have to keep fresh fruit out. Fruit gives off ethylene gas, which can sterilize the bulbs. I let my bowl reside in my spare refrigerator for 4 weeks. Then I moved them to the cold cellar for 6 weeks. During the cold duration, check the bulbs every week or so. 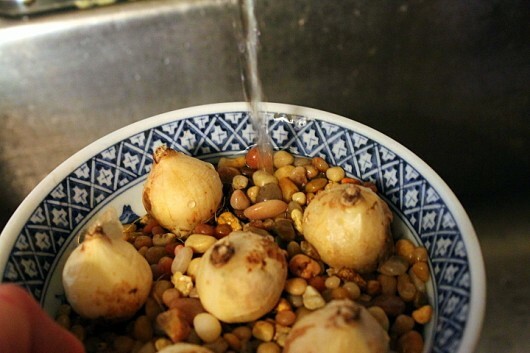 Add water to the bowl as evaporation occurs. When you are ready to force the bulbs, bring them to a sunny window in a cool room (65°F max). The bulbs will immediately send up thin strands of grass-green foliage. Flowers will emerge about 3 weeks later. That eventually open into dangling, white-fringed, true-blue bells. 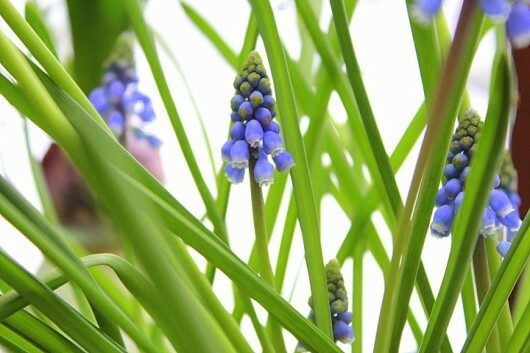 Is Muscari armeniacum worth the forcing-effort? Well, I certainly think so! Thanks for cheering me up. I am looking at 8″ of snow in the yard and two more storms forecast in the next 2 days. That shade of blue is SO lovely. I LOVE that bowl….love the flowers too…I always have flowers on my dining room table to keep spring in the room. You make everything look so easy Kevin. Your home is a dream. I look forward to your newsletter every week! We have some daffodil and tulip bulbs that never made it in to the ground. They have been in the unheated garage. Do you have any suggestions as to what I can do with them? I forgot to get bulbs to do this last fall and I’m kicking myself right now. Making a note to get bulbs for next winter. Do you plant out the bulbs in your garden or do you find that they are spent after being forced? They are just the prettiest shade of blue, Kevin. What a nice way to perk up dreary, cold winter days. That’s one thing old country homes are good for–65 degree rooms where forced bulbs can thrive! 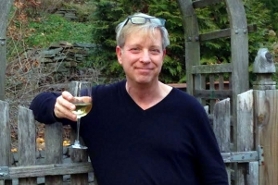 Kevin, your Grape Hyacinth article is so timely for me today. Last March I bought a pot of them in full bloom. As the flowers died off, I continued to water the folliage outdoors. When winter settled in, I brought them into our sunroom where it never gets below 46. I noticed that the foliage stayed green and continued to grow. It is now about 30 inches long. The first of January 20l5, I noticed little tiny starts popping up. I continued to water and also brought them into the house where they would get even more sunshine in a south window. I now have l3 blooms with a mild hyacinth fragrance. I remembered your water vases with flowers in your window and “planted” a regular hyacinth in a tall vase. I can’t believe how fast the roots are growing in the water and how fast the plant is growing. I also had a lovely pink Hyacinth blooming in the house at Christmas this year. My son gave it to me last year for Mother’s Day and I left the bulbs in the pot. I am really enjoying my winter gardening thanks to you. Just one question. 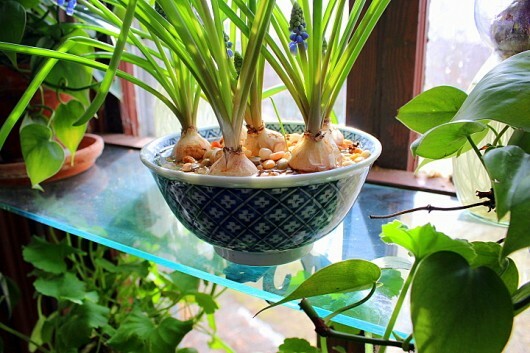 What other bulbs will react the way Hyacinths do? I can’t wait to try them too. 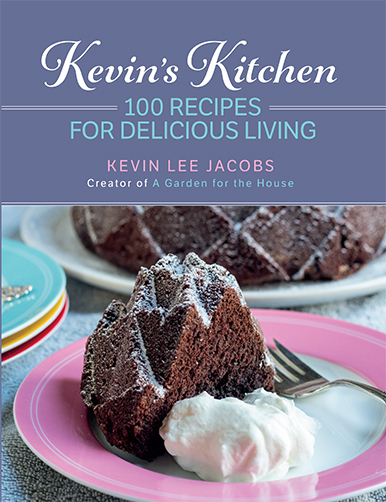 Your articles, recipes, and house tours are all wonderful. Thanks for being you. Just wanted to pop in to say that I used your bulb forcing advice for hyacinths and “drunken” narcissus (with gin) earlier this winter and they are just blossoming and smell wonderful. I’ve always failed with bulb forcing in the past so THANK YOU. I love having flowers around the house in the winter and this way I have a bargain alternative to buying fresh flowers each week. I have them in the small “nostalgia” blue glass Ball jars with stones in the bottom for the bulbs to rest on and they look so pretty on my window ledges. 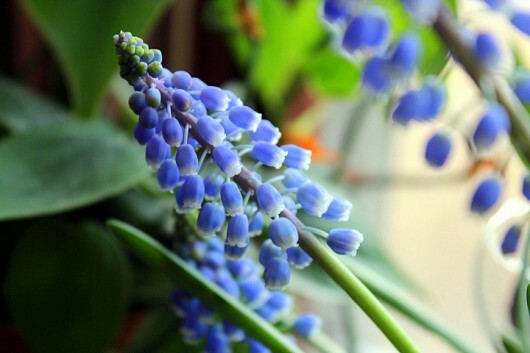 I will definitely add grape hyacinths next year. Thanks for great tips and an enjoyable blog! ps- I love your chive pesto recipe and make it all the time to eat on Triscuits for a semi-healthy snack. Kevin, the link for ginger tea (and I tried to reach it several ways) gives me the message that it’s a fraudulent site. You might want to check with Microsoft. I can access it through Mozilla, but not Windows. I wouldn’t want someone to be tampering with your site. Just a head’s up. 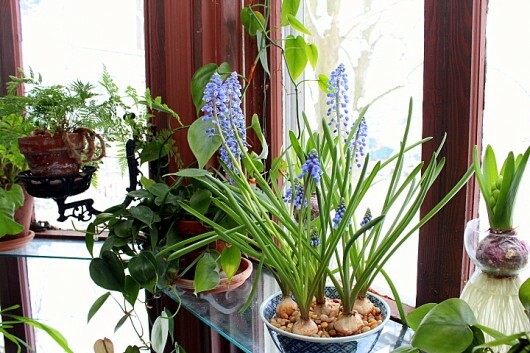 I took white-leaved muscari plants out of the basement six days ago and placed them on a window sill that gets some sun. Their leaves have turned a medium green and small green flower buds, about 1/2″ long, have appeared near the base of each plant. From your blog I have a better understanding of what to expect. I hope mine grow as prettily as yours!